Time to pop Uptown’s newest slot until the wins fall out! May is here and to welcome this extraordinary month we’d like for you to bop and pop towards wins with up to a 225% Match + 50 Free Popiñata Spins! Popiñata is Uptown’s newest slot – and if you haven’t give it a try, May is the perfect month to do so! Hit the spin button and land winning combinations with assistance from tacos, a sombrero, a donkey piñata, beer, jalapeños and fireworks! 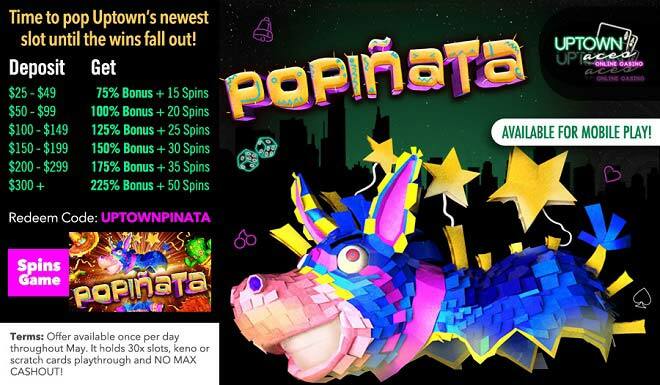 Get ready to roll on the floor while collecting huge May wins when spinning the reels of Popiñata!